I want to deadlift 600lbs by the end of the year, my best right now is 545.5lbs (247.5kg) in competition at a bodyweight of ~194lbs. For my next competition on june 7th, my goal is to achieve a 565lbs deadlift in a lower weight class. I plan on competing at 82.5kg or 181.5lbs. My thought process of improving deadlift lockout strength has always caused me to rely on doing rack pulls and block pulls to work on weak points in my deadlift. Where does my deadlift slow down? For me it’s after It gets past my knees. All weights between 475+ I’m grinding through that range. I an confidently lockout 500-515lbs on any given day, but they are grinders. I keep thinking that in order for me to build strength I need to work on my weak points more aggressively. In other words, more rack pulls, pin pulls and block pulls. Overloading with a shorter range of motion. 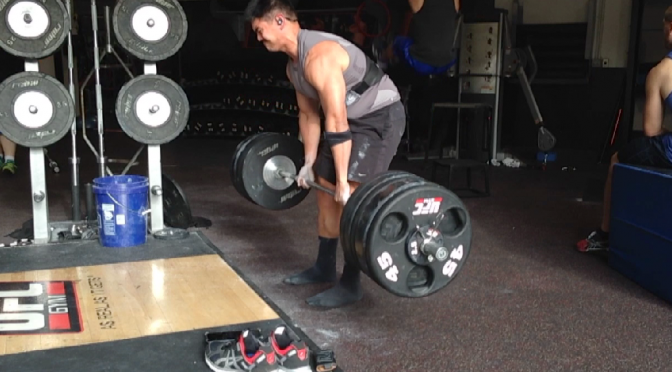 However, one of my greatest strengths of my deadlift is being able to accelerate the weight through that sticking point. I find it easier to pull 455lbs off the ground vs pull it from 4 or 6 inch blocks. In the video above I talk ramble on more. But in case you want more reading this article from elite fts and jts strength are good articles discussing improving deadlift lockout strength.